Lynn M. Gorfinkle, 64 of Redding, Connecticut, an animal rights activist, died Sunday, December 25, 2011 at Danbury Hospital. Mrs. Gorfinkle was the wife of Michael A. Gorfinkle. She was born in Bridgeport, CT, July 31, 1947, daughter of George and Elinor (Lincoln) Eckstein. Lynn resided with her parents in Fairfield before marrying Mike in 1965. A resident of Redding since 1977 coming from Virginia (one of the many moves with Mike working for IBM), Mrs. Gorfinkle was an animal rights activist for her entire adult life. As president of the Animal Rights Alliance of Fairfield County she spearheaded a cat rescue group, Project Save A Cat, as well as CT-NAB (CT No Arrows or Bullets), an organization for advocating the coexistence with wildlife especially deer. In addition to her passion for animal rights, she also enjoyed participating in drum circles and facilitating drumming workshops for community groups and particularly Alzheimer's patients at various health care facilities. In addition to her husband of forty-six years, she leaves many friends. A Celebration of Lynn's Life will take place at a later date. There will be no calling hours. Contributions in Lynn's memory and honor may be made to Project Save A Cat, Animal Rights Alliance, P.O. Box 434, Cos Cob, CT 06807-0434. Kane Funeral Home, 25 Catoonah Street, Ridgefield is in charge of arrangements. Shawnee was found on the side of Interstate 85 in Petersburg, VA in the spring of 1975 and Lynn intervened to save her. Shawnee’s right rear leg was fractured in many places. 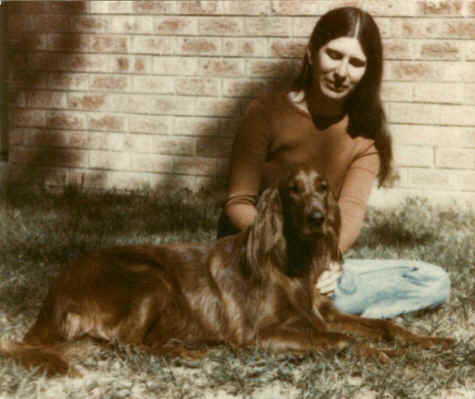 She evidently had been lost and wandering since even though she was an adult Irish Setter, she weighed only 35 pounds. After much persuasion by Lynn, the vet, who felt helping Shawnee was not worthwhile since in his opinion she was injured too severely, put a steel pin in her leg to allow it to mend. Lynn took Shawnee to another more benevolent vet who wormed her twice and prescribed expensive special food for several months to get her weight back to normal as you can see in the picture. Ironically, getting hit by a car was the thing that saved her. This picture was taken in the summer of 1976 in our backyard in Midlothian, VA.